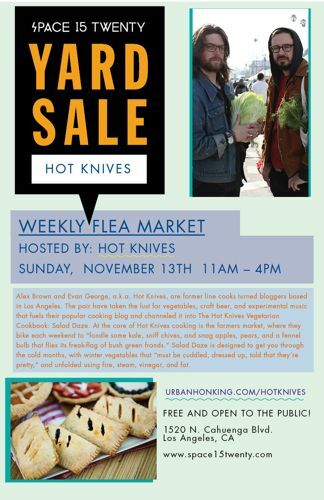 quarrygirl.com » Blog Archive » hot knives yard sale this weekend. aka the place to be. FYI – the thanksgiving pop tarts are ABSOLUTELY NOT VEGAN.. if you watch the video of Hot Knives making them they put a big stick of butter in there..
@”wtf”: i have an email from hot knives saying that the pop tarts at the event will be vegan. i just sent them a reply to confirm. will keep ya posted. No need to tread carefully, they’ll be completely vegan! @”wtf”: as evan clarified above, the pop tarts will be vegan. whew! and BTW, all the HK events i have been to have been extra vegan-friendly. just stay away from the cheese, and you’re usually cool. they are always very careful to let folks know what is vegan and what is vegetarian! If they say it’s vegan, you can be confidant that it is!